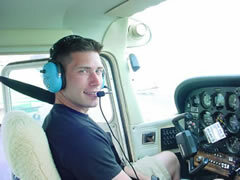 Flight training is a course of study used when learning to pilot an aircraft. The overall purpose of primary and intermediate flight training is the acquisition and honing of basic airmanship skills. 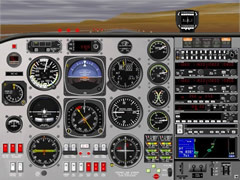 Although there are various types of aircraft, many of the principles of piloting them have common techniques, especially those aircraft which are heavier than air types. All training courses consist of some combination of theoretical learning conducted on the ground, and practical exercises conducted in the air. Initial training is often conducted in specialised training aircraft, which are designed for benign handling characteristics and lower costs compared to the aircraft which the pilot concerned is ultimately aiming to fly. Flight simulators are also used to train pilots in some circumstances, at much lower cost and risk than actual flying. The minimum amount of flight training required for private pilots is generally set at 40 hours, however most students require 50-80 hours of training. The FAA Knowledge Test is administered at designated testing centers and consists of a computer-generated 60 question multiple choice exam. Practical Tests are conducted by an FAA or FAA-designated examiner. 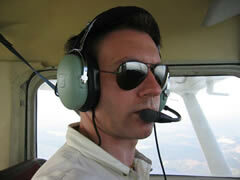 Upon satisfactory completion of the practical test, a private pilot certificate is immediately issued. This "Flight Lessons " page consists of Aviation Schools, Pilot Schools, Aviation Careers in the Airlines, Commercial Pilot Aviation, Pilot Training, Flying lessons, Student Pilot and Commercial Pilot Flight Training Information. Here is a link to the FAA "Pilot Training" Website including Pilot Study Materials, places to find FAA approved Flight Schools and more.